To you remaining black members of my family who take issue with me being an outspoken black conservative Republican, I ask you ponder the following. 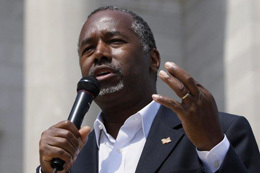 Comedian Arsenio Hall was known for his comedic bit, "Things That Make You Go Hmmm..." Well, here are a few facts regarding self proclaimed black advocates and the mainstream media's disdain for Dr Ben Carson that make you go hmmm. But guess who supposed advocates for black empowerment rallied behind and transformed into heroic icons of civil rights? The answer is black criminals; Treyvon Martin, Michael Brown and Freddie Gray. Keep in mind that the supposed advocates for blacks that I mentioned hate Dr Carson. Shouldn't that make a thinking black person go hmmm? And yet, the mainstream media and Democrats ignored the grand jury's report and continues to promote the lie that Brown was gunned down by a racist white cop while on his way to his grandma's house. Black Lives Matter, mainstream media and other so-called black advocates persist in ignoring facts; such as in only 35 years 324,000 blacks have been killed by fellow blacks. As a matter of fact, 93% of blacks are killed by other blacks. http://bit.ly/1NSDXRE Racist white cops "ain't" the problem y'all. Drug dealer Freddie Gray had a record as long as your arm. http://bit.ly/1lOh0bM Treyvon Martin was also a prolific thug. http://bit.ly/1NgbZmG So again I ask, why would so-called advocates for black empowerment make saints of black criminals while relentlessly attempting to demonize Dr Carson? Dr Carson's path of education, hard work, Christian faith and right choices led him to extraordinary success and possibly even the Oval Office. Martin, Brown and Gray's criminal choices made them menaces to society and led to their early deaths. Wouldn't true black advocates encourage black youths to mimic Dr Carson rather that elevating criminals Martin, Brown and Gray to black superstar status? Common sense tells us that self proclaimed black advocates and the mainstream media obviously have another agenda other than their stated justice/empowerment for blacks. The truth is these slime-ball so-called black advocates and media hacks do not give a rats' derriere about blacks. If they did, they would honestly deal with the self-induced issues plaguing the black community; epidemic school dropouts, drug abuse, black on black crime and out-of-wedlock births. But no, black advocates and media would rather blame conservatives, Republicans and white America. Black Lives Matter, mainstream media and Democrats want blacks to conclude that Martin, Brown and Gray were the products of being victimized by racist white America; particularly conservatives and Republicans. That is a lie. Life is about choices. Circumstances tend to reveal who you are inside. My 87 year old black dad also grew up poor and fatherless in the Baltimore hood. As a little boy, Dad chose to earn money shining shoes on weekends at the Greyhound Bus Station. One of his buddies chose crime; two kids in similar circumstances making different choices. Dad was taught responsibility at an early age. I could hear the pride in dad's voice as he told me how he spent his first earnings. Out of $1.25 he made one weekend, dad paid rent to Aunt Nee, took in a movie with candy and popcorn and purchased a t-shirt. Dad bragged to a friend, "Yeah man, I'm buyin' my own clothes now." I heard through the family grapevine that some relatives are embarrassed by me publicly proclaiming that blacks are not victims of racist America. To them I say, "Sorry guys, but we are not." My goodness, all one has to do is look around. So why has the mainstream media sacrificed its journalistic principles to help Democrats win black votes? The answer is the media and Democrats are on the same page; socialist/progressive – both desire an America in which the majority is dependent upon and controlled by a tyrannical big government. Oh and both have a bug up their derriere about Christians. Democrats and mainstream media will vehemently deny it, but it is true. In essence, elitist mainstream media and Democrats want George Orwell's novel "1984" – a nation of supplicants subservient to Big Brother. These truths should make logical thinkers go hmmm.